Under Owen’s As-Needed Architectural and Engineering Master Contract, Owen is currently providing designs for upgrades to meet the new USP 800 USP 797, and California Board of Pharmacy (BOP) regulations. The USP 800 is a new standard relating to hazardous drugs (HD) and the safety of personnel. The U.S. Pharmacopeia has implemented USP 797 to control the compounding and administration of pharmaceutical products. The regulations comprising USP 797 are intended to protect patient safety, worker safety, and environmental protection by preventing the contamination of compounded sterile preparations. USP 800 has also been adopted to protect patients and pharmacy personnel from exposure to hazardous drugs as part of compounding. Many State Board of Pharmacies have also adopted their own regulations. Potentially impacted pharmacy staff include, but are not limited to, pharmacists, pharmacy technicians, nurses, physicians, physician assistants, home healthcare workers, veterinarians, and veterinary technicians. This project, subject to OSHPD (Level 1) compliance, will expand the existing compounding facility by 36 sq. ft. to total 307 sq. ft. 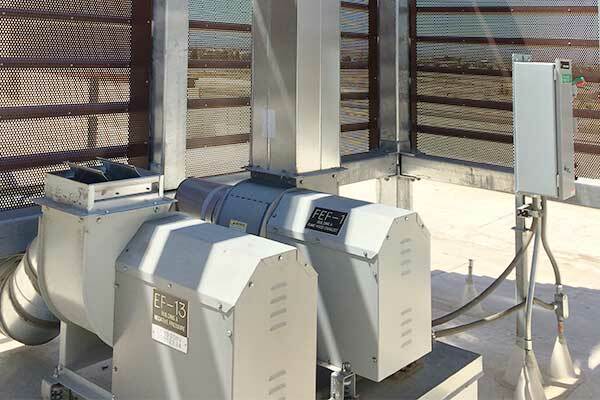 The scope entails adding two (2) CACI hoods, renovating the HVAC system to provide neg/pos air pressure, renovating lighting systems, and providing a new BMS pressure differential systems. This project, which is subject to OSHPD (Level 1) compliance, will add a new Ante Room to the existing 270 sq. ft. compounding facility. Owen’s scope includes the addition of one CACI hood; renovation of the HVAC system to provide proper neg/pos air pressure, adjust air change rate, temperature control, and filtration air leakage; provide new BMS pressure differential system, and install a new eyewash system. This project, which is subject to OSHPD (Level 1) compliance, will expand the compounding facility by 40 sq. ft. to a total of 320 sq. ft. and add a new Ante Room, add of one CACI hood; renovate of the HVAC system to provide proper neg/pos air pressure, adjust air change rate, and temperature control; renovate lighting systems; provide new BMS pressure differential system, and replace various room finishers, and filtration air leakage; provide new BMS pressure differential system, and install a new eyewash system. This project is being upgraded to meet current USP 797, USP 800, and BOD pharmacy facility requirements. This is a non-OSHPD facility. The project will expand the compounding facility by an additional 40 sq. ft. This is necessary to accommodate a new HD refrigerator. The HVAC system is being renovated to provide proper neg/pos air pressure, as well as adjust air change rate and temperature control. Provide new BMS pressure differential system and install an eyewash center. This is a Non- OSHPD existing facility and is 220 sq. ft. This project will renovate HVAC system to provide proper neg/ pos air pressure, as well as adjust air change rate and temperature control. All lighting systems will be renovated. The project will also provide new BMS pressure differential system and install a new eyewash system.